Occupational Therapy is the use of purposeful activity with individuals who are limited by Physical Injury or Illness, Psychosocial Dysfunction, development or learning disabilities, Poverty or Cultural differences or the aging process in order to maximize independence, prevent disability and maintain health. Lecturer Occupational Therapy - 1 Nos. Additional Lecturer – Occupational Therapy - 1 No. Assistant Lecturer – Occupational Therapy - 1 No. Occupational Therapist - 3 Nos. Skilled worker / Splint Technician / Jr. Technician (Orthotics) - 1 No. Gross and Fine Motor Assessment related to Developmental Stages. Assessment for Impact of Sensory Issues on Performance. Hand Function Assessment including Speed and Dexterity. Evaluation of Independence in Activities of Daily Living(ADL) and Instrumental ADL. Assessment of Musculoskeletal and Cardio Respiratory status for Endurance and Strength. Assessment for prescription of Appropriate Wheelchairs. Assessment for prescription of Specialized Seating Devices and Mobility Aids. Physical Capacity Evaluation for return to work. Functional Capacity Evaluation for return to work. Audit of Architectural Barriers affecting Access in home, Transportation Systems and at work. Assessment of Oral Motor Functions. Splinting and Self help Devices Fabrication and Training. Assessment of the Handicapped Driver for Certification of Fitness for Driving. Prescription and Modification of Specialized Seating Devices and Mobility Aids. Advice regarding Energy Conservation, Work Simplification and Joint Protection Techniques. Physical Capacity Evaluation, Work Assessment and Simulation. The department participates as team member in the outreach services offered by the Institute such as medical camps. Myoelectric Prosthesis and Myotrainer Demonstration and Training. Fabrication of Hand Splints using low temperature Thermoplastic and Neoprene Material. Use of Computerised work simulation system for work related rehabilitation. Research is conducted in the Department on a regular basis. Research dissertations of postgraduate Students are guided by departmental faculty in addition to paper Presentations & Publications at National & International Level. 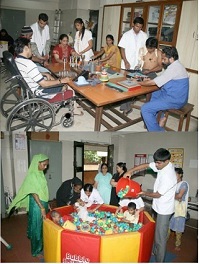 Department Conducts MOT(Masters in Occupational Therapy) teaching programme affiliated to MUHS Nashik. The Departments makes extensive use of standardized objective methods of assessment.